When it comes to cutlets, my favorite is Chicken Cutlet. In my hometown, there was a bakery near my house. Everyday I make it a point to eat a Chicken Cutlet from there. I like to eat the cutlets with tomato ketchup. My mom also makes tasty cutlets. 1. In a mixing bowl, combine chicken, onion, ginger garlic paste, curry leaves and followed by turmeric powder, chilli powder, coriander powder, all purpose flour, rice flour, corn flour, salt, and coriander leaves. Mix the ingredients well. Keep it aside for 30 minutes. 2. Meantime, keep the bread crumbs ready. Now, take a small ball of the chicken mixture and shape it as desired. I have shaped it round. Now coat the chicken balls with the bread crumbs well. Heat 2 tablespoons of oil in a dosa pan/flat pan. Then fry the chicken cutlet on both sides until golden brown in medium flame. Drain them on paper towels. Now, Chicken Cutlets are ready! Serve hot. Tomato Ketchup with thinly sliced onion rings. 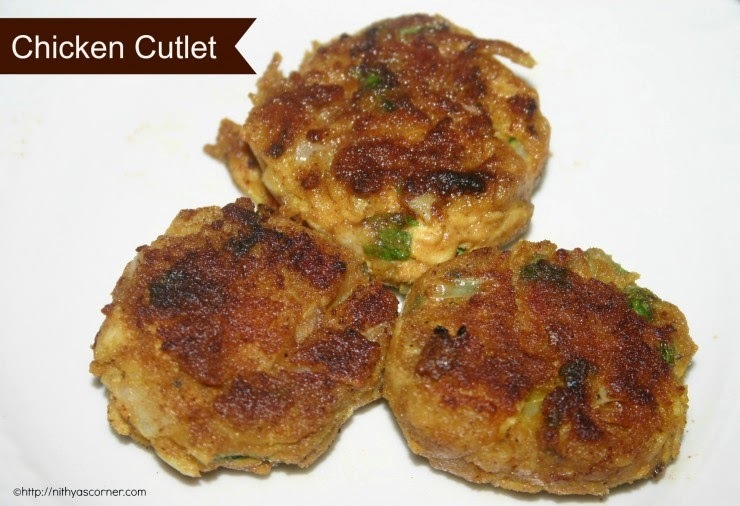 You can use this cutlet as burger patties. You can also use boiled and mashed potatoes along with minced chicken. You can use a cookie cutter and shape the chicken mixture as desired. I have made heart and oval shaped cutlets. Dip the cookie cutter in oil just before you shape the chicken mixture. If you are not concerned about oil, then you can deep fry the chicken cutlets in oil until golden brown.Sometimes, cutlets may get over fried and become black. So, be careful and stand near till you get your cutlets done. 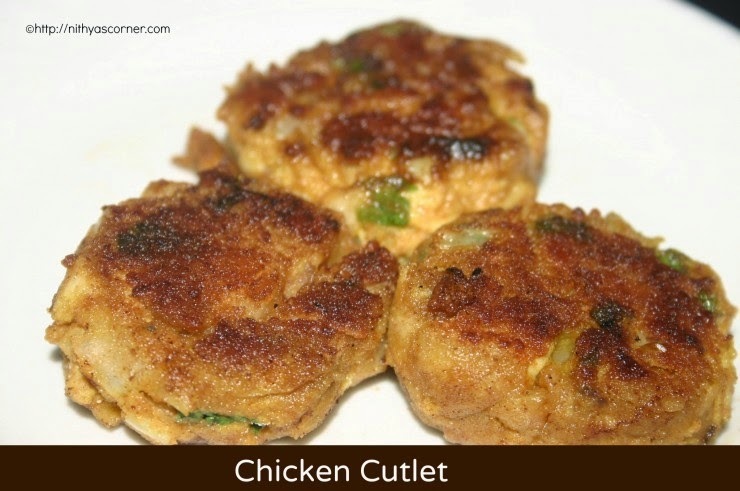 This entry was posted in APPETIZERS | STARTERS | SNACKS, Chicken on November 20, 2014 by vikashbhardwaz. Chicken Thighs – 10 nos. 1. In a large bowl, add chicken pieces and all the ingredients except egg white and bread crumbs. Add little water such that chicken thighs are well coated with the spices and powders. 2. Marinade the chicken for an hour. Then coat the chicken well with beaten egg white. 3. Again coat the chicken well in the bread crumbs. Meantime, preheat the oven to 425 degrees. Cover the baking pan with an aluminum foil. Sprinkle oil on the foil. 4. Wipe the excess marinade off the chickens, and place the marinated chicken on the aluminum foil or baking pan. The chicken pieces should not touch each other. Leave enough space between them. Then, place the baking pan in the center rack of the oven. Broil the chicken for 15 to 20 minutes. Now, take out the baking tray and using a thong, turn the chicken pieces over and broil again for an additional 15 minutes. Chicken should look crispy and charred in some edges of the chicken. Chicken should begin to come off the bones. Chicken juices should run clear when you pierce it near the bone with a sharp knife. Now, Chicken Lollipop is ready! Serve. With Tomato Ketchup or Mint Raita. 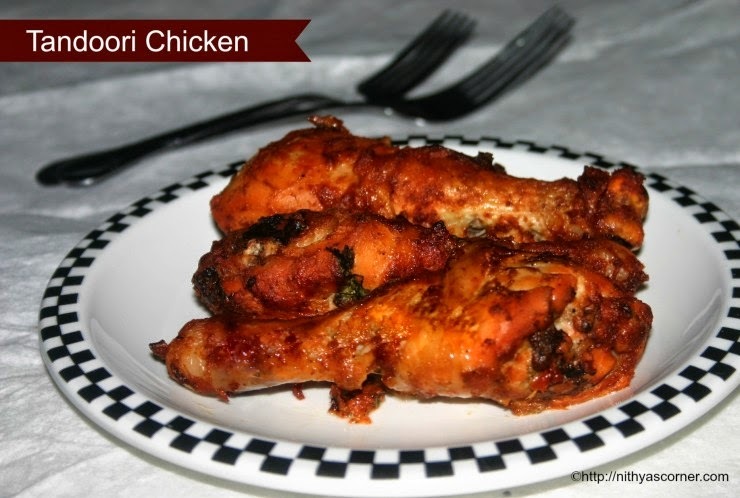 If you like this recipe, you can also try Tandoori Chicken and Pottukadalai Chicken. Oven timings varies with each oven so make sure you check yours carefully. If the chicken pieces are cooked on low heat, then the chicken will become tough once cooked. 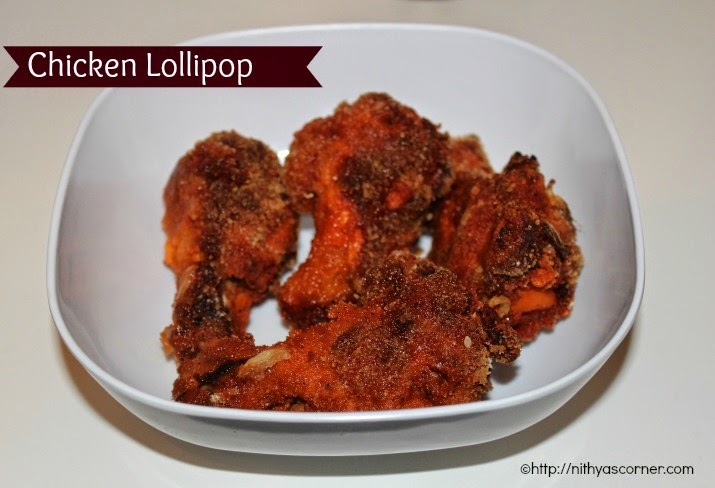 Chicken thighs are best for Chicken Lollipop. You can also deep fry it in oil. My mom was here for my second delivery and made a lot of soup varieties for me. This is one of the soup variety she made often at least twice a week. I liked it so much. She learned this recipe from a cookery book. It is a very simple and easy soup to make. You can have it with bread sticks or cheese sticks. The onions add an extra zing to the soup. Adding fried onions to the soup is my mom’s idea. When she said she is going add fried onions, I hesitated but then when I tasted I just loved it. Adding fried onions is purely your choice. You can omit it if you do not want it. 1. Heat a pan and melt butter. Add mushroom and fry well. Remove the fried mushroom and keep it aside. In the same pan, fry the onions in melted butter until they become golden brown and keep it aside. 2. In a vessel, heat 3 cups of water and add chicken pieces. Boil well. You can see froth floating on top. Remove the froth. 3. Add fried mushroom and salt to the boiling water. Stir well. Then, mix corn flour in 2 tablespoons of water and make a paste. Keep the corn flour mixture aside. 4. Now, add the cornflour paste and let it boil for 15 minutes. Then add pepper powder and salt. Mix well and boil for 5 minutes. 5. 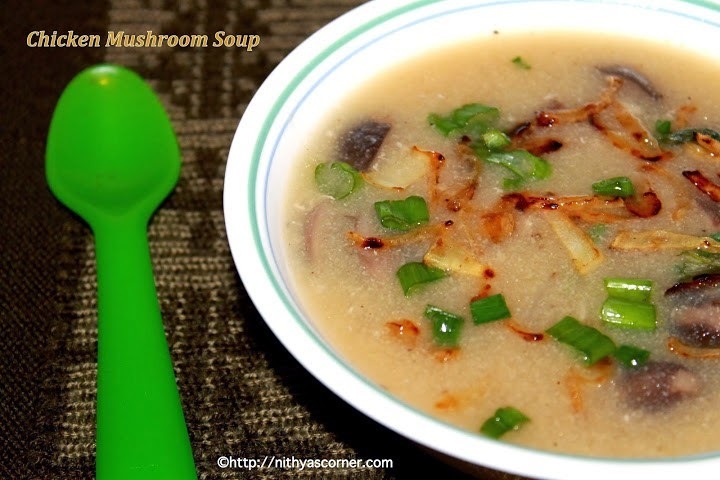 Now, garnish the Chicken Mushroom Soup with fried onions and chopped spring onions. 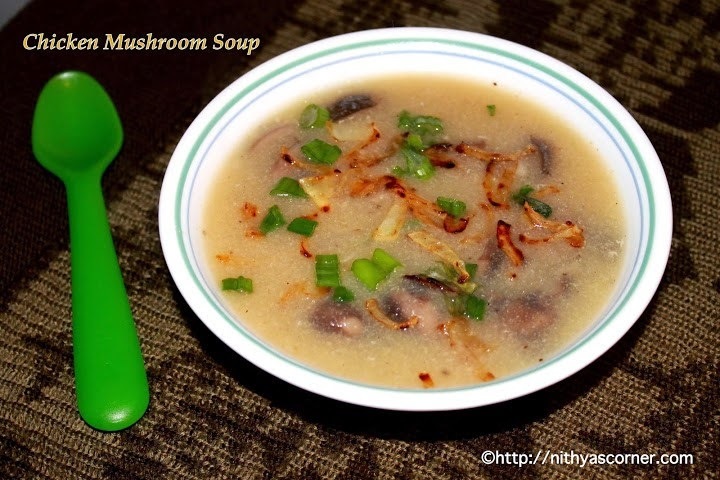 Now, Chicken Mushroom Soup is ready! Serve hot. My paternal grandfather and my dad love Pakodas. Whenever we go to my grandparents house, my grandfather will ask my grandmother to make Pakodas for us. If not, he will buy Onion Pakoda for us when he returns home. He would simply taste each and every pakoda with so much joy. My mom makes pakorda every other sunday for us. She would make a variety of pakoda like potato, ladies finger, brinjal, plantain, onion etc. After my marriage, she told me that she tried Chicken Pakoda and it turned out very good. She said it repeatedly for two days and asked me to try at home. I then got the recipe from her. I had a bunch of mint leaves in the refrigerator. 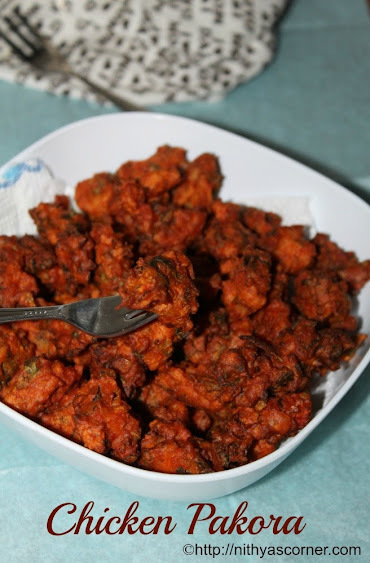 I wanted to finish it off and that is when I thought I’ll make this tasty Chicken Pakoda. It came out well. My neighbor, who is an Indian friend, came and asked what was I making as she smelled a very good aroma around my house. When I said Chicken Pakora, she wanted to taste some. She loved it so much and she made the Pakoras the very next day and her family loved it. 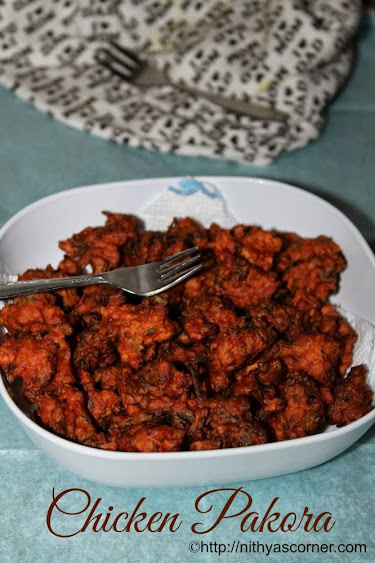 My friend urged me to post the recipe here so here am I with the Chicken Pakora Recipe…I should only thank Late Chef Jacob for sharing a yummy recipe. 1. Boil the chicken and then crumble it into small pieces. Reserve the chicken stock. 2. In a mixing bowl, add corn flour or rice flour, chilli powder, besan flour, turmeric powder, and a pinch of red food color. Then add crumbled chicken, coriander leaves, salt, and mint leaves. 3. Now add onion, green chillies, and ginger. Mix well. Now just sprinkle the reserved chicken stock and combine well. Make sure you do not add more chicken stock and make the batter soggy. 4. Cover the pakoda batter and leave it aside for about 15 minutes. Meantime, heat oil in a wide bottomed pan. To check if the oil is hot, add a very tiny piece into the hot oil. If it comes up soon, then the oil is ready for deep frying. When the oil is medium hot, using a teaspoon, drop the batter in the hot oil. 5. When the pakodas turn crispy and golden brown, take them out and drain in a tissue paper to remove excess oil. Now, the Chicken Pakoda is ready! Serve with Mint Yoghurt Dip or Tomato Ketchup. 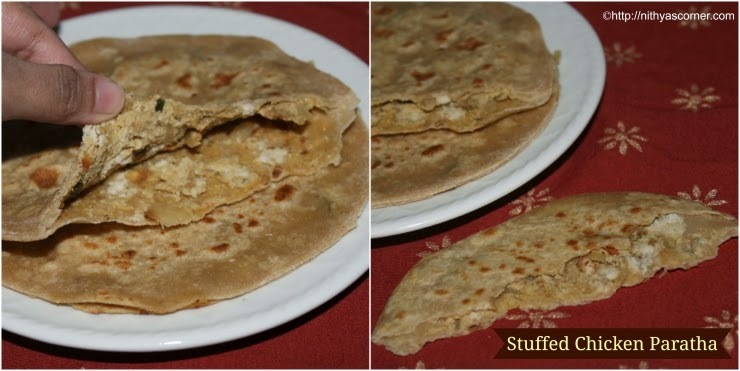 I still remember when I had this Stuffed Paratha for the first time. My father’s close friend invited us for a dinner. Aunty made Stuffed Mutton Paratha, and our family instantly fell love with it. The paratha was way too soft and was almost melting in our mouth. I was a fussy eater then. When aunty wished to serve each and everyone with more than two parathas, everyone said that they were already feeling heavy. You know what???? I was secretly longing to have more. The Stuffed Mutton Parathas tasted heavenly. My mother tried the same recipe with Chicken in a couple of days at home, and she came very close to the taste. 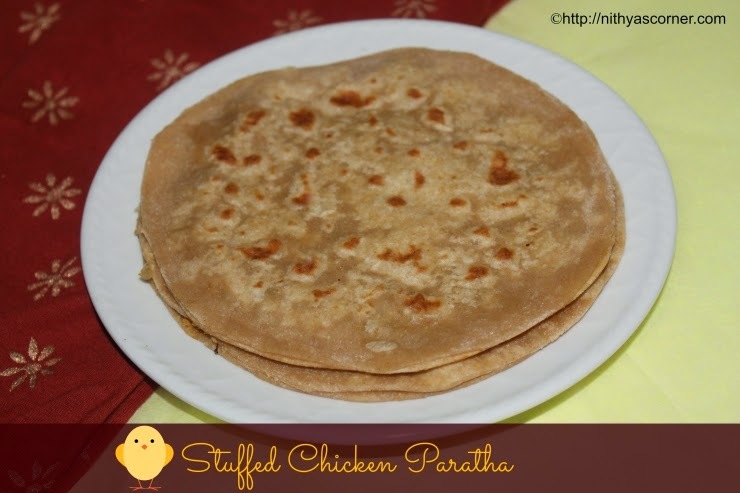 We loved the taste of Stuffed Chicken Parathas. 1. In a mixing bowl, combine wheat flour and salt by adding warm water. Knead the dough and let it rest for 20 minutes. 2. Meantime, boil the chicken, drain the broth, and keep it aside. Then grind the chicken along with coconut. 3. Keep the ground chicken aside. Chop all the vegetables. Heat 2 tablespoons of oil in a pan and then add chopped onions. 4. Add fennel powder and ginger garlic paste. Mix well and then add finely chopped capsicum and tomatoes. Fry well until the raw smell of ginger garlic paste goes off. 5. Add turmeric powder, ground chicken, and coriander leaves. Add a tablespoon of water. Mix well and cook until the chicken is done. Keep the stuffing aside, and let it cool down. 6. Now take a small portion of the dough (a medium sized lemon) and make it into a ball by rolling between your palms. The balls should be smooth and without cracks. Do the same for the remaining dough. Now, place the smooth ball on the board and dust it with the flour. 7. Using the roller, roll the ball into four to six-inch rounds. The rolled rounds should be neither too thick nor too thin. Keep the stuffing in the center of the rounds. Place another rolled round on top of the chappathi. 8. Give a gentle press using the roller. The top and bottom chappathis should stick together. Then cook the chappathis on both the sides. Now, the Stuffed Chicken Paratha is ready! My mom makes Tandoori Mugh very well. She makes Restaurant Style Tandoori Chicken and my father love sit. Gj loves the Tandoori Chicken that my mom makes. This time when she came here, I learned the trick from her. 1. Prick the flesh of the chicken all over with a fork. Then, using a sharp knife, cut deep slits in 2 to 3 places on the leg/thigh pieces of each chicken. The knife needs to touch the bone. The slits should be deep and big. This will allow the marinade to penetrate well, and the chicken will absorb flavors. In a mixing bowl, add butter, curd/yogurt, Kashmiri chilli powder, turmeric powder, garam masala powder, chilli powder, coriander powder, ginger garlic paste, saffron/red color, and black salt. Taste the marinade for salt and spice and adjust accordingly. At this stage, salt and spice should taste extra strong. Yogurt/curd needs to be thick so that it sticks to the chicken properly. If you have taken curd/yogurt straight from the refrigerator, then let it come to room temperature otherwise it may curdle. Sometimes, the color of the marinade may stick to the mixing bowl well. You may find it difficult to wash. In order to avoid this, you could put the marinade in the ziplock bags/plastic bags. 2. Add chicken and combine them well. Place 4 tablespoon of pickle on a plate. 3. Then apply the pickle all over the chicken. Marinade the chicken for about 10 to 12 minutes. Then cook the chicken in whichever method you prefer. I have broiled the chicken. Heat oil in a pan. When the oil is in medium-high heat, add the chicken pieces carefully. If the oil is very hot, then the chicken may have cooked well outside and stay raw inside. You should fry the chicken until the chicken is cooked inside and turns dark red/brown outside. Preheat the oven to 425 degrees. Cover the baking pan with an aluminum foil. Wipe the excess marinade off the chickens, and place the marinated chicken on the aluminum foil or baking pan. The chicken pieces should not touch each other. Leave enough space between them. Then, place the baking pan in the center rack of the oven. Broil the chicken for 15 to 20 minutes. Now, take out the baking tray and using a thong, turn the chicken pieces over and broil again for an additional 15 minutes. If you see chicken caramelizing, do not panic. The burning flavor will give a unique taste to the chicken. 4. When the chicken turns golden brown and cooked, then remove it. Using a tong, cook the chicken on all sides on direct fire for about a minute. 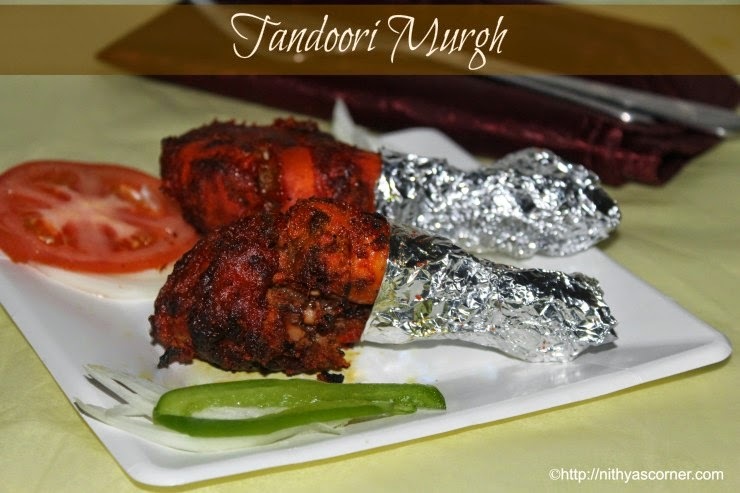 Now, Tandoori Murgh is ready! Garnish Tandoori Chicken with coriander leaves, lemon wedges, slices of cucumber, and red onion. Serve with naan and Mint sauce in yoghurt or yogurt-based raita on the side. In our family we all love Tandoori Chicken. We make it almost every Sunday. My mother does lot of variations. My father would say my mom’s Tandoori Chicken is the best. She would make it so well. I also make it almost everyday because Sanvi loves it. Even if I don’t make it, Sanvi would ask me “Amma, mmm I have chickkkk…” On Sundays, Gj prefers to have Tandoori Chicken and even when we have a group of friends at home, I make Tandoori Chicken. Here, I have written the recipe in detail keeping the beginners in mind. I have explained it as much as I could. If in case you are stuck on something or have questions, do mail me. 1. In a mixing bowl, add curd/yogurt, chilli powder, turmeric powder, cumin powder (seeraga thool), garam masala, coriander powder, coriander leaves, ginger garlic paste, oil, saffron/red color, and black salt. Taste the marinade for salt and spice and adjust accordingly. At this stage, salt and spice should taste extra strong. If you need more taste and not concerned about adding pickle, then add 4 teaspoons of pickle. It could be any pickle. I learned this tip from Chef Dhamu. 2. Remove the skin from chicken pieces. Prick the flesh of the chicken all over with a fork. Then, using a sharp knife, cut deep slits in 2 to 3 places on the leg/thigh pieces of each chicken. The knife needs to touch the bone. The slits should be deep and big. This will allow the marinade to penetrate well, and the chicken will absorb flavors. 3. Now, rub the marinade into the chicken flesh well. Sprinkle coriander leaves. Cover the chicken marinade, and refrigerate it for minimum 1 hour. You should not marinade and refrigerate it for more than 2 days as the citric acid in the chicken marinade will spoil the Tandoori Chicken. The marination will help the chicken to absorb the juices and flavors well. My minimum time is 1 hour. My maximum time is 1 day. I have not grilled Tandoori Chicken before, but I’ve seen my friends doing it. I’ve seen my friends grilling the chicken on direct heat. How can I find out whether my chicken is cooked? 1. 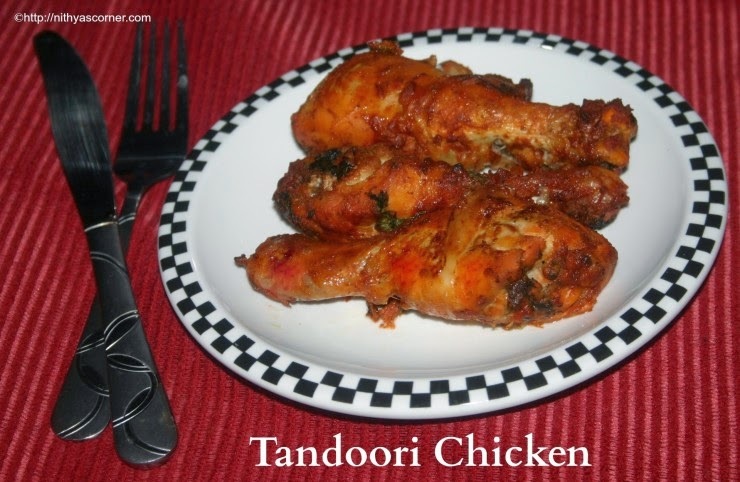 What are the ways I could cook Tandoori Chicken? 2. 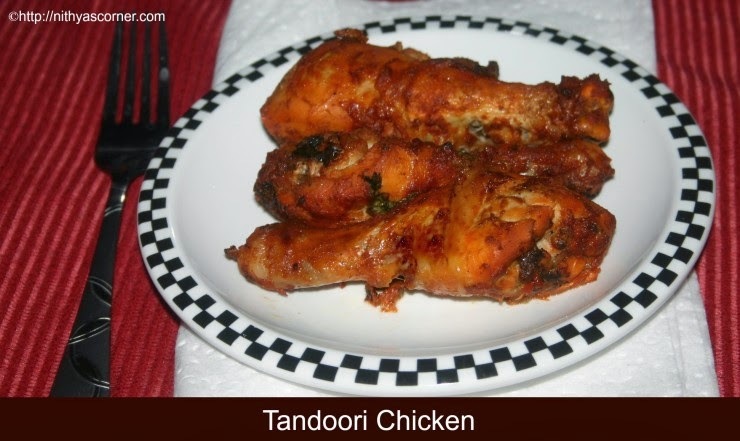 Which part of chicken should I use for Tandoori Chicken? Use small bone-in thighs/drumsticks and legs as they have lot of fat to keep the chicken moist in the heat. Chicken breasts will dry out easily under heat. Chicken breast will cook faster than the chicken bone-in thighs/drumsticks so keep a check on your cooking time. 3. Can I use chicken with skins? Prefer using chicken pieces that are skinless. It is quite easy to remove the skin from the chicken. 4. I have only chicken with skins. What can I do? Follow the same cooking method, and slowly fry the chicken until crispy. 5. I do not like yoghurt/curd. Can I skip it? You can skip using yogurt/curd, but the taste would be slightly different. Add a little extra oil and lemon juice to compensate for yogurt/curd. If you have sour cream, then substitute it for yogurt. Just use half the amount of sour cream. 6. Can I use skimmed milk yoghurt? Always use full fat curd/yoghurt. Sometimes skimmed milk yoghurt will curdle when cooked on hight heat. If you wish to use low fat yoghurt, add 1 teaspoon of plain or corn flour per cup of yoghurt. 7. Can I use ready-made tandoori mixes? Many restaurants use ready-made Tandoori mixes. It gives a bright red color to the chicken. 8. What vegetables can I use with the same Tandoori marinade? Peppers, aubergines, tofu, paneer, cauliflower, mushroom etc. 9. I have some chicken pieces left? Can I use them later? Marinade all of the chicken once. Put the chicken pieces that you do not want to use in plastic bags/ziploc bags and freeze them. Do not crowd the chicken in the plastic bags. 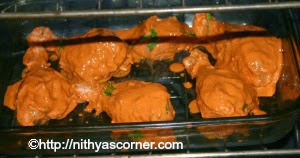 When you want to make Tandoori Chicken, take the chicken bags out, thaw the chicken and cook. 10. Can I avoid using artificial colors? 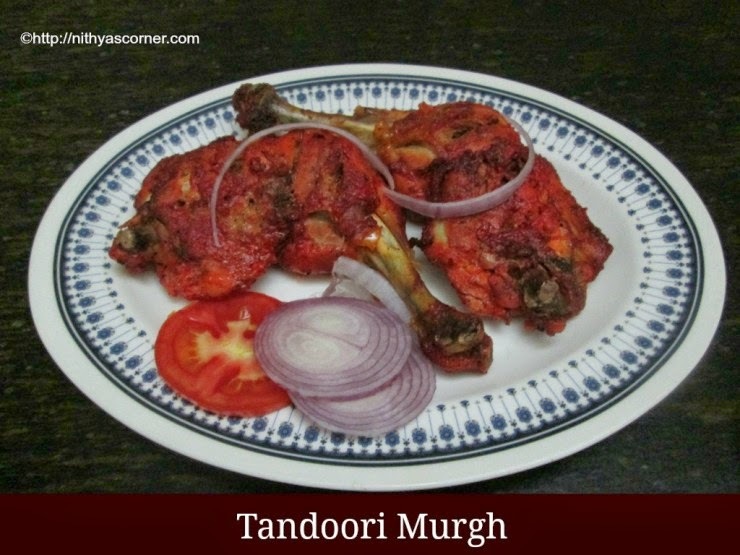 Tandoori Chicken can be made without any artificial flavours and colors. Usually, it is better to avoid adding artificial colors to the chicken. You will not be able to get that thick bright red color. Your chicken will instead look brown in color. 11. How can I get a deep red color to the chicken? You can add saffron/artificial color and kashmiri red chilli powder to the chicken. 12. How long should I marinade the chicken? I usually marinade for minimum 1 hour and maximum would be a day. It varies from person to person. Some marinade for 5 to 6 hours. Some even for 2 days. Do not marinade the chicken for more than 2 days as the citric acid in the lemon will spoil the taste of the chicken.